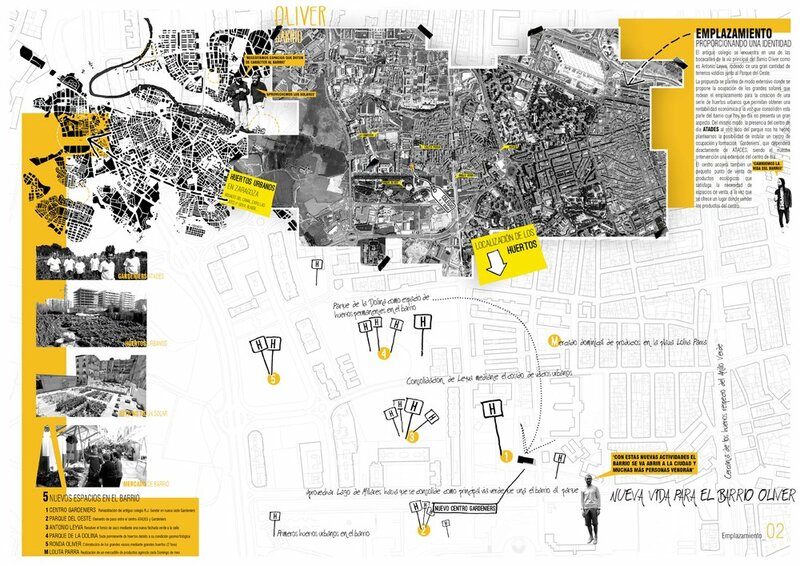 We are group of students from the School of Architecture in Zaragoza University. Some of us have just finished the School and others are doing an internship in national firms at the same time that are finishing our final thesis. The old school Ramon J. Sender is rehabilitated as school gardening for ATADES association, and as a space available to neighborhood activities. This operation is associated with urban voids due to its new use as agricultural soil. This is an opportunity to revitalize the street San Vicente Ferrer, the backbone between the street Antonio Leyva and Oeste Park, the green area and the symbol of the neighborhood. 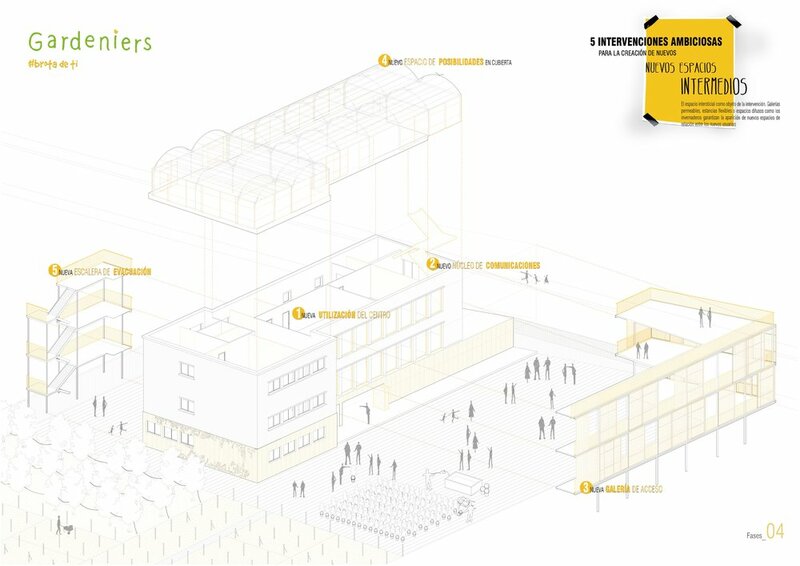 The school emerges as a trigger element for a new horticultural use of urban spaces in the neighborhood, as a new focus of local activity and social cohesion through cooperative work, support local economy and the interaction with ATADES students. Thus, a serie of actions are proposed over time to try to maximize the usable area of the building, to equip it for his new occupation, and to improve its urban presence and thermal conditioning using passive techniques. Interior refurbishment. We begin with the demolition of the ancient walls becoming the old corridor in new laboratories and spaces of working for the future school. During this phase we also resolve the technical problems like isolation or humidities. New communications. Introduction of a new elevator an existent wall and construction of a new self-holding metal staircase in order not to damage the structure. Double skin façade. This phase has three main objectives. - Creation of a new access directly from the street. - Liberation of the interior of the preexistent building introducing a new in-between space. - Improvement of the bioclimatic character of the construction, isolating in winter and protecting from the sun in summer. Construction of a new space in the roof. In order to emphasize the character of the gardening school we build a new greenhouse in the roof. This space allows the owner to rent it and get extra incomes to pay the intervention.